For all current events related to C.M. Mayo's other publications and workshops, please visit the main events page. Jeffrey Mishlove interviews C.M. Mayo about her book, Metaphysical Odyssey into the Mexican Revolution: Francisco I. Madero and His Secret Book, Spiritist Manual for "New Thinking Allowed"
C.M. Mayo: "On Writing About Mexico: Secrets and Surprises"
C.M. 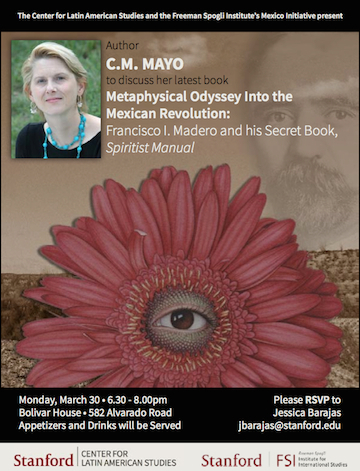 Mayo will discuss her book, Metaphysical Odyssey into the Mexican Revolution: Francisco I. Madero and His Secret Book, Spiritist Manual. She will also discuss her translation, the first, of Madero's Manual espírita of 1911. These two events, for the Spanish edition published by Literal Publishing, Odisea metafísica hacia la Revolución Mexicana, translated by Agustín Cadena, will be in Spanish. presenta la Dra. Lucía Beltrán. Código Áureo - Gerardo Proal Galería, 5 de Mayo #80, esquina Altamirano, Centro Histórico; presentan el Dr. Andrés Garrido del Toral, cronista oficial del Estado de Querétaro, y la Dra. Guadalupe Zárate, investigadora del INAH. Habrá vino de honor y firma de ejemplares. Teléfono 214 1497. Presentation of the Spanish edition translated by Agustín Cadena, Odisea metafísica hacia la Revolución Mexicana, Francisco I. Madero y su libro secreto, Manual espírita por C.M. Mayo. With: Rose Mary Salum, Literal Publishing; Luis Cerda; Dr Javier Garcíadiego; Manuel Guerra de Luna; and Dra Yolia Tortolero Cervantes. Vino de honor. Cupo limitado. Favor de reservar. C.M. Mayo provides a rich introduction and the first English translation of Spiritist Manual, the secret book by revolutionary and former Mexican President Francisco I. Madero. The podcast of this event is now available. Listen in anytime on podomatic or on iTunes (free). Admission is 100 pesos, which includes a complimetary glass of wine with dinner at Vivali's across the street. Madero's Secret: C.M. Mayo talks about her latest book of nonfiction, plus a translation, Metaphysical Odyssey into the Mexican Revolution: Francisco I. Madero and His Secret Book, Spiritist Manual. The podcast of this event is now available. Listen in anytime on podomatic or on iTunes (free). C.M. 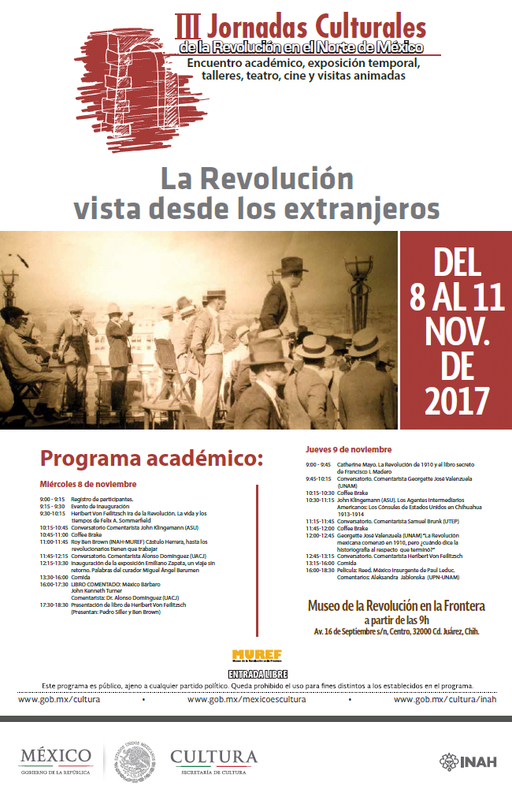 Mayo to speak on Francisco I. Madero y su libro secreto, Manual espírita, as part of the conference on Francisco I. Madero. Ignacio Solares will also speak about his novel, Madero, El otro. For the Spanish edition, Odisea metafísica hacia la Revolución Mexicana, Francisco I. Madero y su libro secreto, Manual espírita, click here. The Kindle edition with the all new book-length prologue, Metaphysical Odyssey Into the Mexican Revolution: Francisco I. Madero's Spritist Manual Introduced and Translated is now available. Some events for this book will be scheduled for 2014. If you would like to be notified, sign up for the free newsletter here. 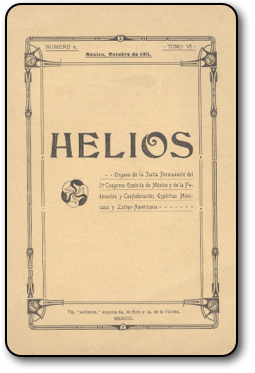 New: a page about issue 6 of Helios, 1911, the Mexican Spiritist magazine which featured news about President Elect Francisco I. Madero and the Spiritist Manual (claiming, falsely, that "Bhima" was not Madero). There is also a page with the English translation of the text on the cover; the masthead; an advertisement for the Spiritist Manual; and the first page of an article about Francisco I. Madero. Just posted: the podcast of C.M. Mayo's talk about Madero's Spiritist Manual for the PEN / Sol Literary Magazine Reading Series in San Miguel de Allende, February 22, 2012. C.M. Mayo, author of The Last Prince of the Mexican Empire and translator of Francisco I. Madero's Manual Espírita, 1911. C.M. Mayo will read from and discuss her introduction to and first English translation of Mexican Revolutionary leader and President Francisco I. Madero's 1911 Spiritist Manual. Spiritist Manual will be published by Dancing Chiva as an e-book this November 11, 2011. To be alerted when this title is available, please join the Dancing Chiva mailing list. C.M. 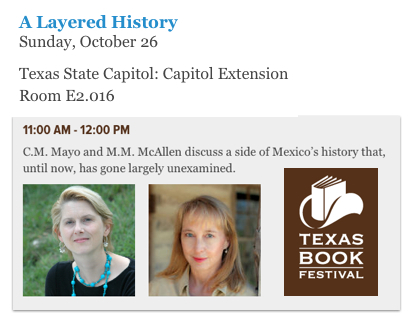 Mayo will present and discuss the work and its importance in understanding the Mexican Revolution on November 10, 2011 at the Author's Sala Reading Series in San Miguel de Allende. >For more information, and more events, please visit C.M. Mayo's events page.